A sadistic dad who was jailed for murdering his baby girl was stabbed in the eyes by an inmate using a sharpened paint brush and a razor blade taped to a toothbrush. Andrew Randall, 38, was left screaming in agony and blind in one eye after he was brutally attacked by fellow lag Jason Jay at HMP Long Lartin in August 2011. Wardens at the category A prison stepped in just in time to save the notorious murderer’s life – after his throat was also slashed in his cell. 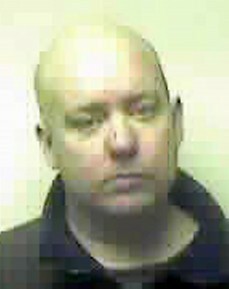 Randall, from Kettering, Northants., was jailed for life in 2007 after he sexually abused, tortured and murdered his seven-week-old daughter Jessica.. The sick dad kicked the baby across the floor, stamped on her chest and put his fingers down her throat as part of his torrid abuse. Jay has already pleaded guilty to three charges – including attempted murder – and will be sentenced at a later date. But on Tuesday two other prisoners were convicted of assisting the attack. A jury at Northampton Crown Court ruled convicted robber Patrick Maughan, 35, and murderer Arthur Pitt-Pladdy, 41, kept watch during the stabbing and turned off an alarm outside Randall’s cell which was activated by another inmate. Pitt-Pladdy – who was jailed for life in 2009 after he brutally stabbed his partner Kim Butler 177 times – was handed a five year sentence to be served consecutively to his original jail term. He was found guilty of encouraging or assisting an offence of attempted murder by cancelling the alarm, which would have alerted wardens sooner. Judge Rupert Mayo told both men he rejected their pleas that they had nothing to do with the attack. He said Maughan’s involvement “lasted some time longer and was rather more sophisticated” than Pitt-Pladdy’s. The judge told Pitt-Pladdy, who refused to go to court to hear his sentence: “You looked through the cell window and saw the attack then lurked on the landing. A prison spokesperson said: “HMP Long Lartin manages dangerous prisoners daily and such events are rare.